We invite you to explore food with your Grandmother (Grandfather, Aunt , Uncle or Parent).We would like you to talk to your Grandmother about food ie. 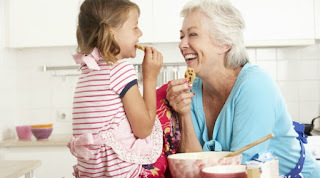 What she(he )liked to eat when she(he) was small, Any food stories she(he) has from your family, Any traditional recipes she(he) has that have been passed down in your family.We would like you to record any stories you share and cook one of her recipes on Grandmother’s Day and tell us why you chose that recipe. This year we are picking the 10 best entries to come and show their project and their dish at The Kitchen Restaurant at the Museum on Good Friday 30th March the start of The Galway Food Festival weekend. The four best entries will talk about their story and recipe and the winner chosen at the end of the evening. We will taste and share all the dishes. Grannies welcome!The winner and runner-up will win a cookery demo with one of Galway’s top chefs for themselves and their school class. All entrants will receive a Slow Food Galway certificate of entry. Please present your entry on a page no bigger than A3. On your entry we would like to see your food story... a recipe and drawing or photograph of you making the recipe with your grandmother.You can present these items any way you like through word or picture, using any media you like.You can be as colourful as you like. Have fun! !It is very important to put your name, age, address and school name on back of your entry.Competition open to children in 3rd and 4th class Primary school.